Our wedding Bell Tents add a magical and romantic touch to any festival or vintage themed event, being especially popular for weddings. The spacious Bell Tents are pre-erected and furnished ready for your arrival at the venue of your choice in Norfolk or Suffolk. 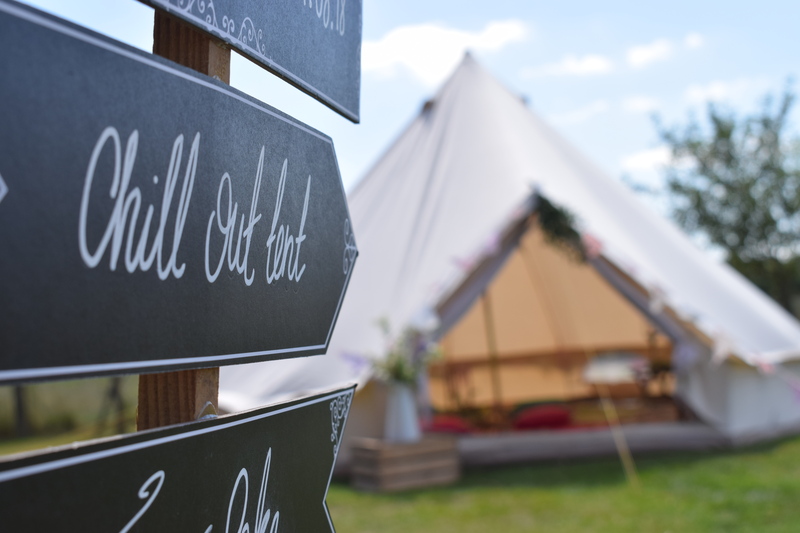 What better way to enjoy your big day than to relax in “Wedding Bell” – our premium camping experience, which features a deep filled double air bed, vintage storage crates, duvets, pillows, bunting, L.E.D lanterns, vintage suitcase and matting. 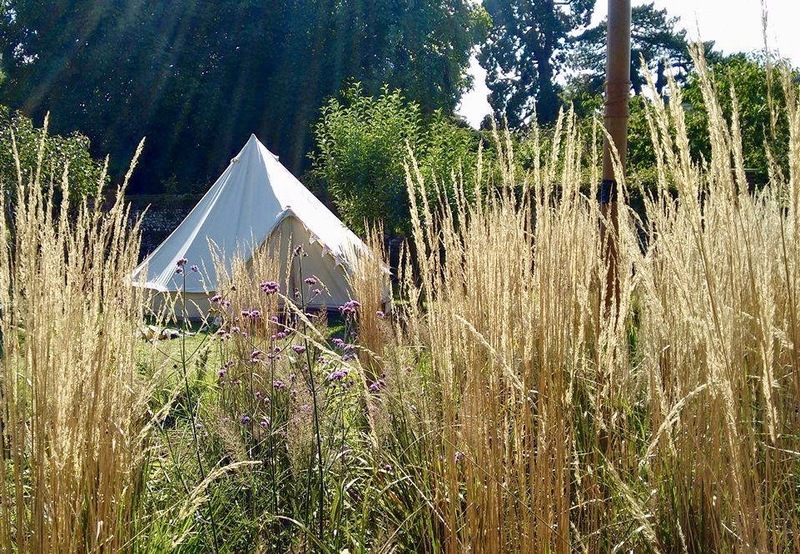 £200 bell tent – hire period Friday – Monday or min midweek hire two days. 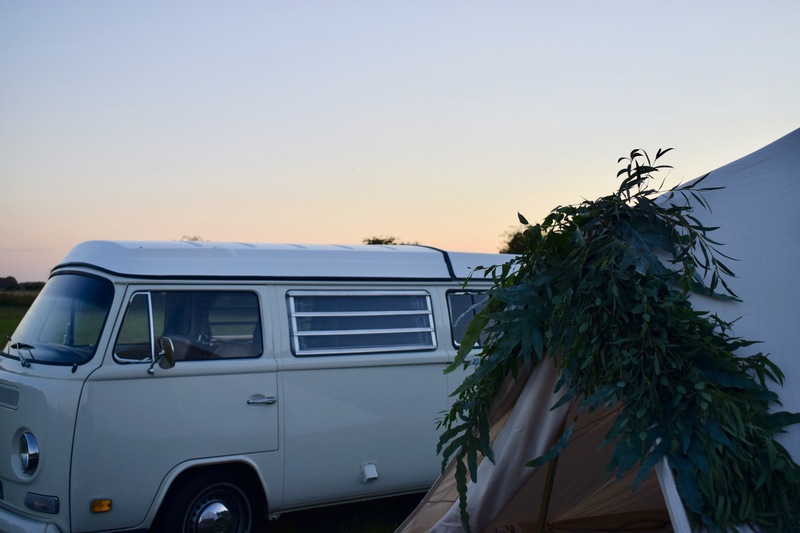 If you would like your guests to share the vintage camping experience on your big day, we can provide a package that will offer your friends and family a comfortable place to rest their heads at your outdoor venue. Generously sized, our tents are able to accommodate beds for 4 or 5 people. 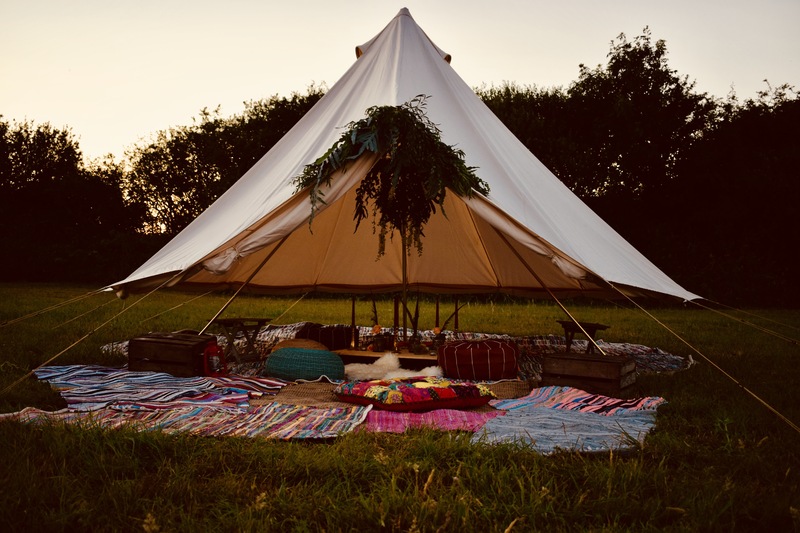 To ensure your friends enjoy their glamping experience, we accessorise with bunting, solar lighting, comfy air beds or camp beds, side tables and scatter mats. For that extra personal touch we can offer matching *bed linen packs. *Bed linen packs contain fitted sheet duvet pillows and covers and are priced at £5 per person. Need somewhere to escape the hustle and bustle of your event? We know that events can occasionally take their toll on the most enthusiastic party animals, so we can offer a refuge away from the hustle and bustle with our chill out tent. 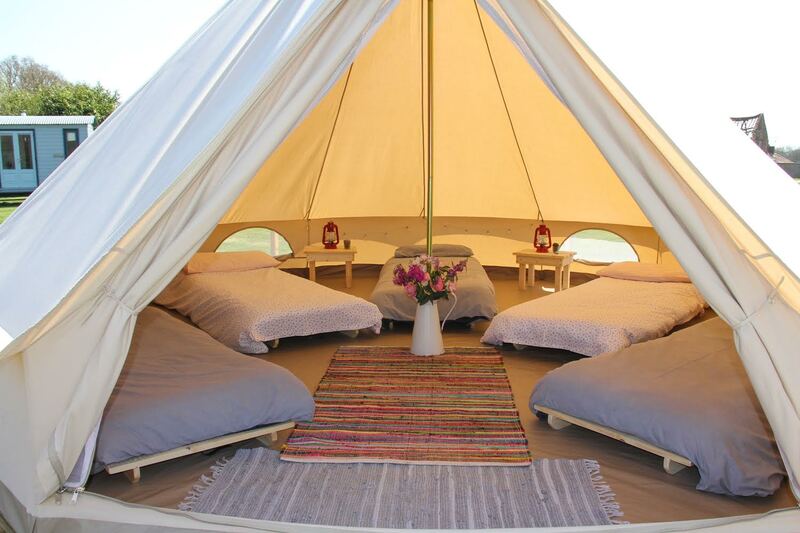 Using our 5 metre Bell tents, we can furnish with rugs and scatter cushions to provide the perfect chill out zone for guests and children to relax and recharge their batteries. £170 weekend hire minimum hire period two days. Our Bell Tents look amazing dressed with flower garlands around the central pole and with our flower arrangements presented in our milk churns, cast iron urns or Kilner jars. Sourcing flowers from local growers where possible completes the rustic, country theme that we love. 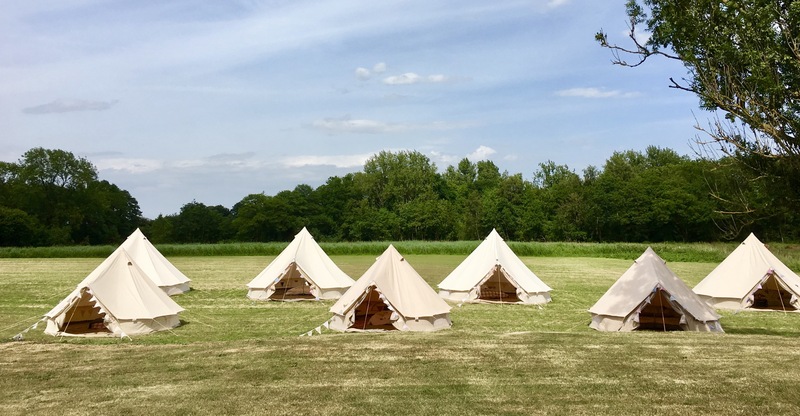 Top Farm is a tranquil and idyllic campsite set in beautiful countryside and woodland, close to the North Norfolk Coast which provides the perfect location for family and group glamping breaks. 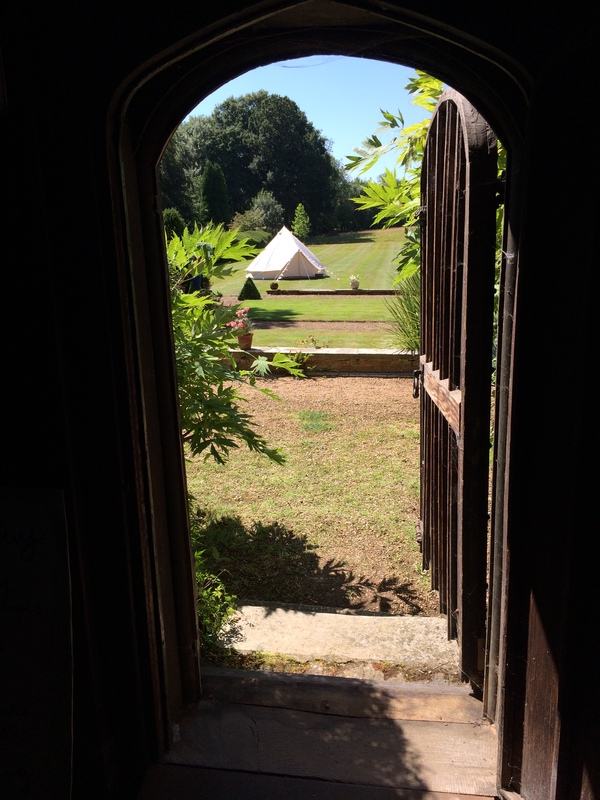 Our bell tents are pre-erected at the site ready for your arrival and our pricing is based on a minimum stay of 2 nights, with maximum occupancy of 5 people. 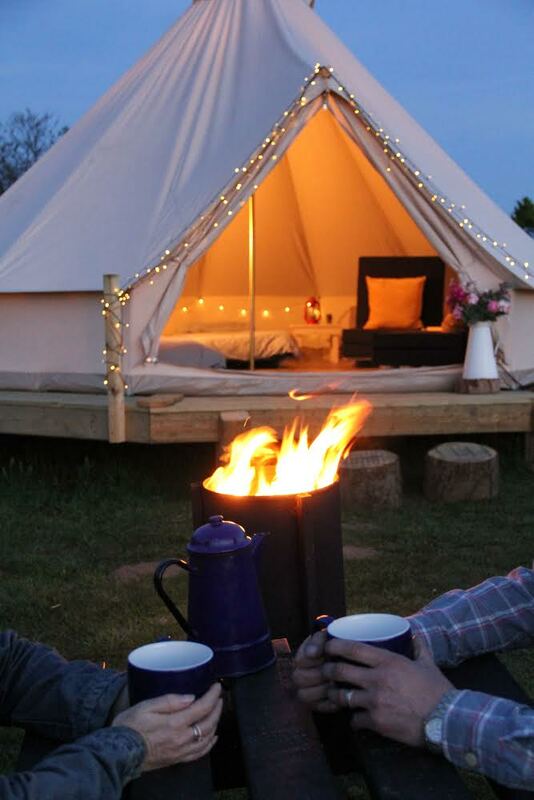 For prices and further information about glamping, weddings and mini festivals available at Top Farm visit www.top-farm.info. 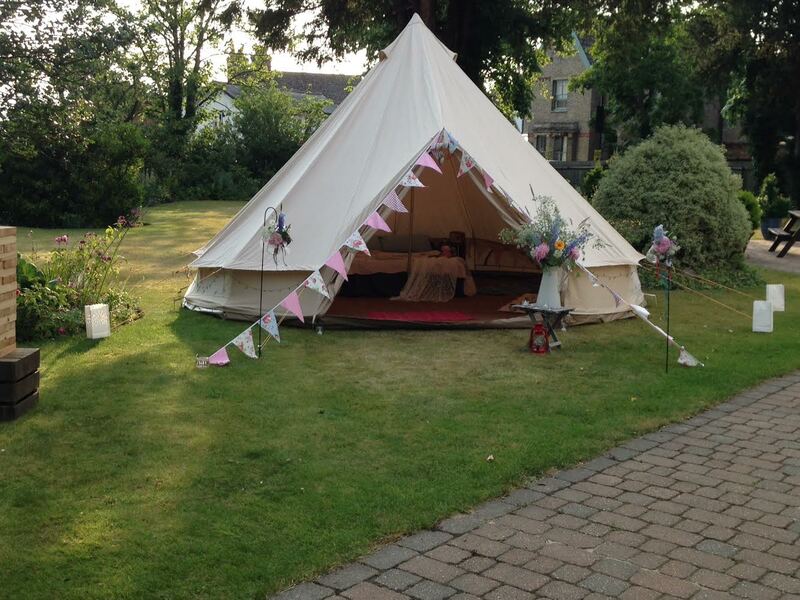 Our beautiful bell tents are suplied by SoulPad a fabulous local company with soul!